The meditation space in my room is pretty much complete. 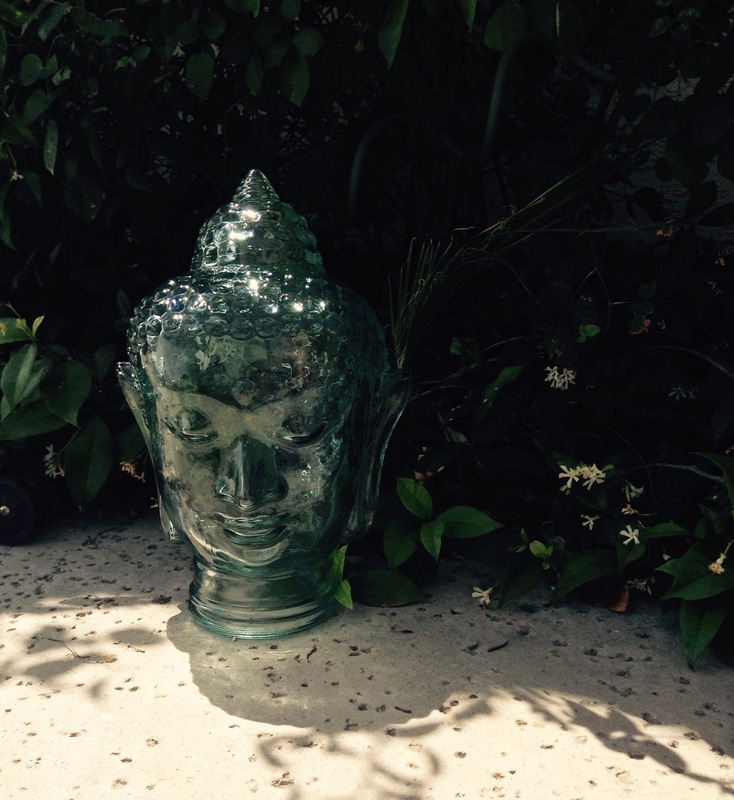 In an earlier post I had showed you this beautiful glass Buddha head that I had recently purchased. In that time I have acquired more items and found some I thought I had lost. Some I forgot about and others were given to me. What I thought was going to be a small table in a corner turned out to be a whole wall, and I just love it. In this picture is old and new. The drawers I found while I was out and about one day. I really didn’t have a purpose for it, I just knew I had to have it. 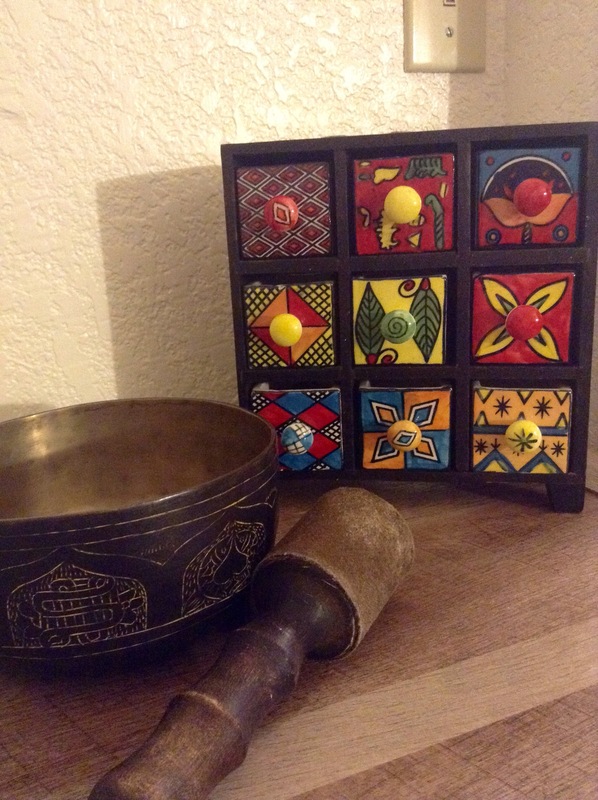 The singing bowl I have had for years, love the sound that comes from it. My mom had sent me some things a few months back that she thought I could use in my little area. 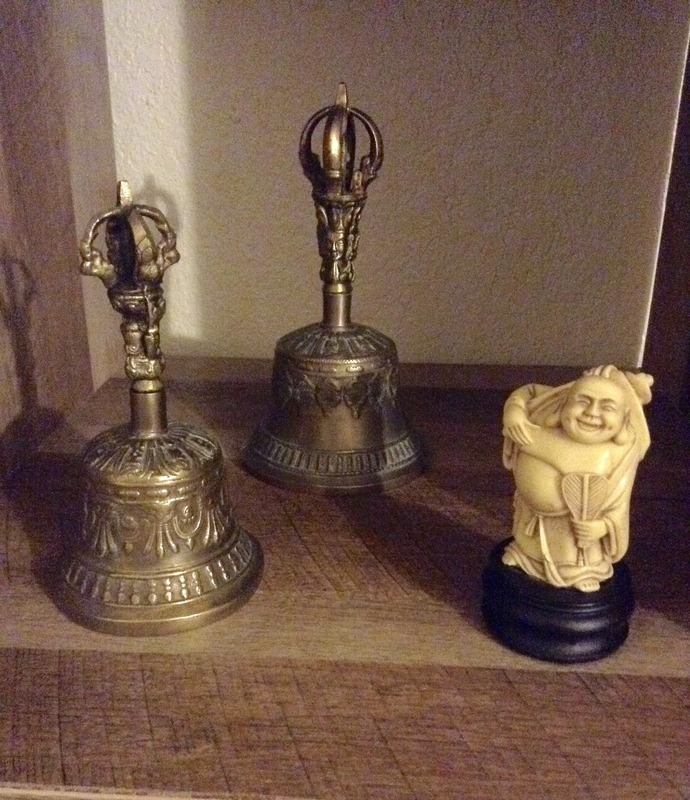 Use I did, the bells and that happy Buddha are right at home. I got rid of my TV (great decision) and created this space. Just looking at it brings a smile to my face. Sometimes I will pick something up and ponder. Inner peace here I come. I keep myself pretty busy and all the while I occasionally forget to stop and smell the roses, or take time for me. I started this blog to tell stories of my life, creativity, food, and whatever else happens to be going on. Instead I get busy, tired, and I forget to do little things, like blog, make jewelry, or beads. I try to make sure everyone else in my life is taken care of and happy, or at least healthy. Ah, the life of a working mom, or any mom for that matter. Now, my kids are older, can take care of themselves so my entire life does not revolve completely around them (lol, yeah right). I am taking time, space, and effort for me, just me. To see if I can find some of my inner peace. One of the things I am working on to do this is a meditation space, somewhere in the house. I have lots of stuff (working towards clearing out the non essential stuff a.k.a clutter) and not enough space. I figured finding the clam meditation stuff was going to be super easy. A few candles, something to sit on, something to focus on, and boom, instant meditation space. Not quite. What I have discovered is, if I want to truly make my space for me I have to find things that “speak” to me. Not buying more stuff to fill more space into my already cluttered home. This too is part of the my journey. I have been looking for a Buddha statue of some sort for the past few months. I figured it would be a fairly easy task seeing how there are Buddha figurines everywhere. I found really cool ones all the time when I wasn’t looking for one. As I searched I found never one that I wanted. Then yesterday I found it! I saw and knew it was for me. It was made in Spain and made of recycled glass. I still don’t know where my space will be, but now, I’m one step closer.